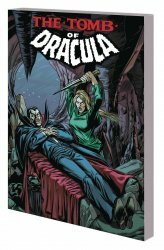 MyMovieMonsters.com > Comics - Archive Books > Marvel Comics > Tomb of Dracula Complete Collection Volume 2 - Marvel Comics - JUST IN! Marvel Comics presents: The Tomb of Dracula, The Complete Collection Volume 2. Square-bound soft cover. 496 pages. Open the tomb once again for tales filled with bloodsuckers, cultists and things risen from the grave! When Dracula attempts to feed on Jack Russell's friend Topaz, it's time for a vampire versus Werewolf by Night showdown -- with the Darkhold as the prize! Blade the vampire hunter closes in, but will the Lord of Darkness be burned by Doctor Sun? It's stakes on a plane when Drac's flight is hijacked -- and the Montesi Formula might spell doom for all vampires! Discover the beginnings of Dracula's feud with the wizard Cagliostro and meet Lilith, his devastating daughter! Plus: The lord of the vampires battles Spider-Man! And tales from Dracula's centuries-long life, including a clash with Frankenstein's monster! Collecting TOMB OF DRACULA (1972) #16-24, WEREWOLF BY NIGHT (1972) #15, GIANT-SIZE SPIDER-MAN #1, GIANT-SIZE CHILLERS #1, GIANT-SIZE DRACULA #2, FRANKENSTEIN #7-9 and DRACULA LIVES #5-7. Copyright 2018 Marvel. Soft cover. 496 color and B&W pages.